These are my first and second sweater creations. Let's hope the next one gets better than these two. Lol, I couldn't wait to make Ginger one... Maybe I should just practice with Peanuts first. Hahaha. We had to laugh at sweater attempt number one. The colors are very nice, though. You seem to be getting closer to getting it right. Keep going! Thanks for the pep talk. I also loved the colors on number one. I bet it'd fit Peanuts. I appreciate your creative input. Every time my neighbors see Coal wearing the sweater, they smile at it because dogs aren't normally dressed here. Well, better than any sweater I've made... ! Hey Haopee! We have never tried boiled meats...but maybe we should! We might like them!! Mama thinks your sweaters are WAY better than any she could make us! I am thankful to know that I am not alone in my hardships in life... ^_^ Now maybe if I try Step 1 sweater on Peanuts. That's funny - but you have to get 10- out of 10 for trying!! Lol. I'll take that 10/10 as a compliment... I use standard yarn. I haven't seen wool being sold here in my city. Ha! That looks about like what I would come up with. I never got the hang of knitting or crocheting. Lol, you're practically better than all of us combined with this one, Helen. Arts and crafts are your forte. I did! Promise! But I didn't use them because I had no pattern to associate the measurements with. LOL sorry but you made me laugh! Good luck next time though! I'm glad to have pleased you ^_^. At least my efforts to please hasn't waned. Trust me, this will not be the end of my crocheting career. Not bad for first tries! Thanks ^_^ you look really pretty on your latest post. The red ones would be perfect for Christmas. Thanks. Coal did wear it for Christmas. I'm going to make one for Peanuts and Ginger. We give you LOTS of credit for trying. Think of it as evolutionary art...the perfect one is just waiting to spring forth! 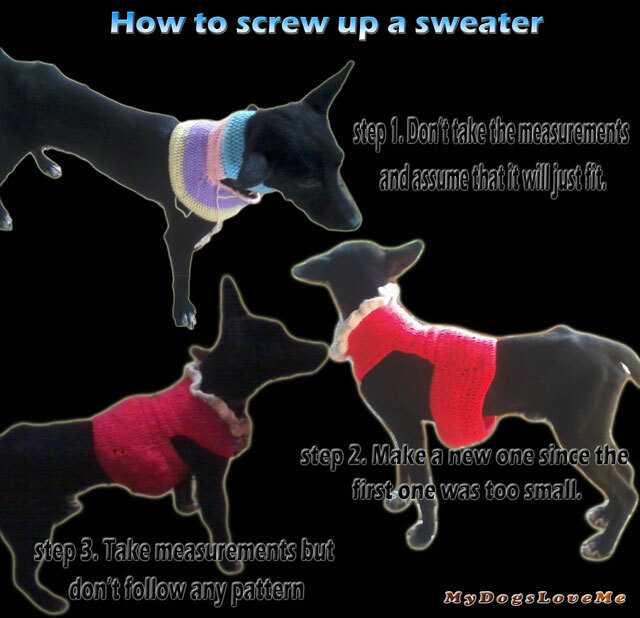 Hope the third one is perfect - I have been there with dog sweaters too! I'm sure the next one will fit perfectly. Hey, who needs a pattern anyway? I suppose now I'm going to have to try knitting a dog sweater! I'm sure that Cisco would appreciate it ~ he's such a wuss!